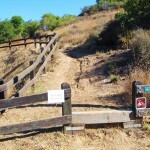 CORBA’s adopted trail, the Los Robles Trail West in Thousand Oaks, wasn’t in very good shape this spring after the winter rains. Long segments were wildly overgrown by mustard and thistle, and some steeper sections had deep ruts. Over the years, the tread of the trail had become U-shaped in cross-section. The natural rims keep rainwater on the trail, where it runs down the middle, taking soil with it and forming a jagged rut. COSCA hired professional trail workers to fix up the trail in the spring. They cut back the overgrowing weeds and filled in the deep ruts. Unfortunately, they didn’t build water diversions (‘rolling dips’) to keep future rain from running down the trail and reforming the rut. Furthermore, the center of the trail, where the rut had been filled in, was much more loosely packed than the rest of the trail, making it much more susceptible to water erosion. The rain that we had in the last two weeks of October was enough to start carving new ruts. At the beginning of November, a rut a few inches deep had formed on one of the steeper sections of the trail. CORBA trail crew members and local residents Danusia Bennett-Taber and Steve Clark spent three hours fixing up the trails. They built two rolling dips on a steeper segment, one near the top and another just above a very steep part. 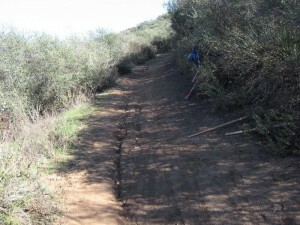 These water diversions will redirect rainwater off the trail so it shouldn’t form another rut. They also filled in the rut on the very steep part at the bottom. Being protected by a rolling dip from above, this rut should not reform once it is packed down by trail users. View a short photo gallery of the work that was done. COSCA Los Robles West Potrero trailhead. The spill-induced rut is much worse a little further up the trail. 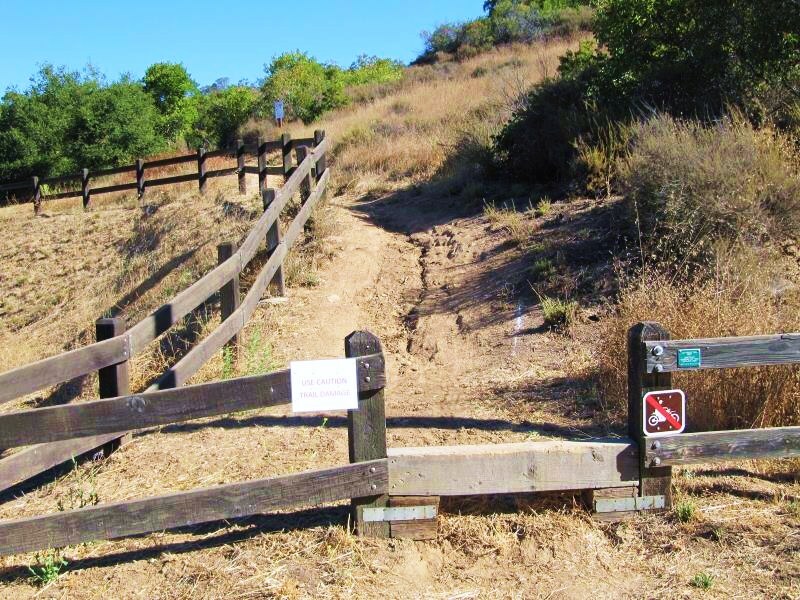 A power outage at a local water facility caused substantial damage to our COSCA (Conejo Open Space Conservation Agency) adopted trail – Los Robles West / Potrero trailhead section. On Saturday August 21st hundreds of gallons of water poured down this trail opening huge ruts and even damaging the parking lot. "Space Mountain" gets its name from the radio towers at the top of the Mountain. CORBA is proud to announce our adoption of the Los Robles Trail West (aka Space Mountain to Potrero Rd.) under COSCA’s Adopt-a-Trail program. 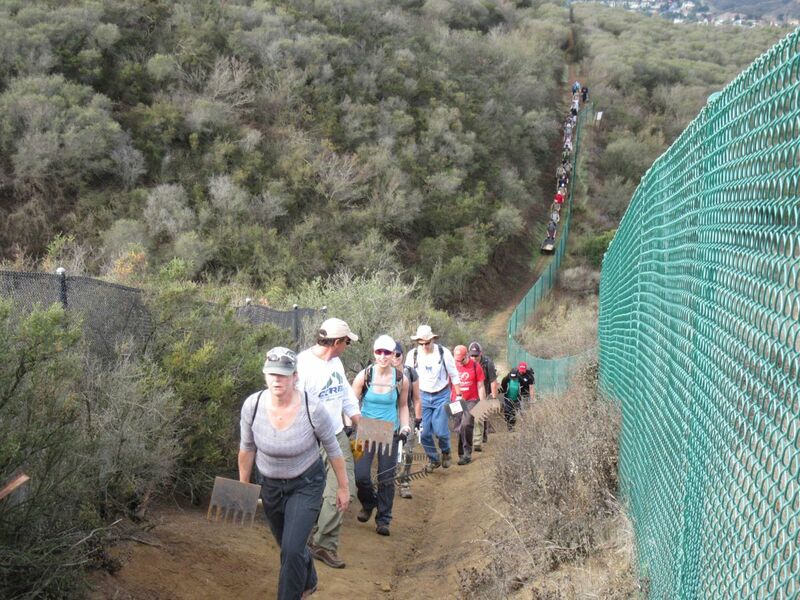 This program allows individuals, civic groups and private companies to adopt trails. Adopting entities agree to provide maintenance for their selected trails on a quarterly basis, as well as regularly monitor conditions on the trail. This is great news for users of this trail. 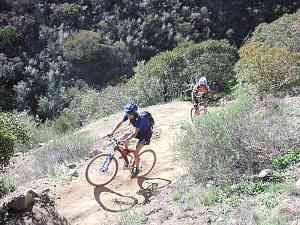 It is a favorite of mountain bikers locally and from all over Southern California. Los Robles West is unique for its tolerance to rain. Good drainage and low clay soil make it ridable after even heavy rainfall, so it is heavily used during the winter. But “good drainage” is not “perfect drainage,” and heading into the summer there are often some rutted sections in need of repair, as well as brush clearance is always required after spring growth. The Thousand Oaks area is fortunate to have a large selection of Conejo Open Space trails open for multiple use. Unfortunately a shortage of resources limits the maintenance performed by the land managers. CORBA is stepping in here to help fill the shortfall. We hope to engage local trail users to help provide ongoing trail maintenance to this trail. We are looking for volunteers and trail crew leaders to help maintain our newly adopted trail. If you would like to get involved please email us, or call us at 818-206-8213.